A mockup of the bunker of German Nazi leader Adolf Hitler is pictured during a July 27, 2017, media tour in Berlin, Germany, of "Hitler — How Could it Happen?" The exhibition examines how he became a Nazi and what turned ordinary Germans into murderers during the Third Reich. More than 70 years after Adolf Hitler committed suicide in his Berlin bunker in the final days of World War II, an exhibition in the capital examines how he became a Nazi and what turned ordinary Germans into murderers during the Third Reich. For decades it was taboo in Germany to focus on Hitler, although that has begun to change with films such as 2004's Downfall, chronicling the dictator's last days, and an exhibition about him in 2010. Hitler — How Could It Happen? 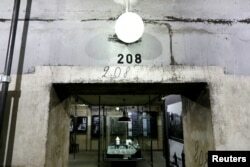 is set in a bunker in Berlin that was used by civilians during World War II bombing raids — close to the bunker where Hitler lived while Berlin was being bombed, which is not accessible to the public. The exhibition examines Hitler's life from his childhood in Austria and time as a painter to his experience as a soldier during World War I and his subsequent rise to power. Other exhibits focus on concentration camps, pogroms and the Holocaust that killed 6 million Jews. 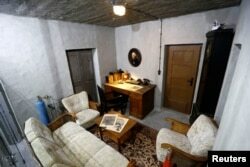 A replica of the original bunker office of German Nazi leader Adolf Hitler is part of "Hitler — How Could it Happen?" in Berlin, Germany, July 27, 2017. It ends with a controversial reconstruction of the bunker room where Hitler killed himself on April 30, 1945, complete with grandfather clock, floral sofa and an oxygen tank. The exhibit is behind glass and is monitored by camera, with visitors forbidden to take photographs. Exhibition curator Wieland Giebel, 67, said the reconstruction had been likened to "Hitler Disney," but he defended the exhibition, saying it focused on the crimes carried out by Hitler's regime. "This room is where the crimes ended, where everything ended," he said, "so that's why we're showing it." Artifacts are pictured during a media tour of the exhibition "Hitler — How Could it Happen?" It's an examination of the life of German Nazi leader Adolf Hitler and features a reconstruction of the bunker where he killed himself, in Berlin, Germany, July 27, 2017. He said he had been asking how World War II and the Holocaust came about ever since playing in the rubble of postwar Germany as a child. The exhibition, he said, attempts to answer that question. "After World War I a lot of Germans felt humiliated due to the Versailles Treaty," Giebel said, referring to the accord signed in 1919 that forced defeated Germany to make massive reparation payments. "At the same time there was anti-Semitism in Europe and not just in Germany ... and Hitler built on this anti-Semitism and what people called the 'shameful peace of Versailles' and used those two issues to mobilize people," he said. A mockup of the bunker of German Nazi leader Adolf Hitler is pictured during a media tour of "Hitler — How Could it Happen?" in Berlin, Germany, July 27, 2017. He said the exhibition showed some Germans became Nazis as they stood to gain personally when the property of Jews was expropriated, while others were attracted to the Nazis because they were unhappy about the Versailles Treaty and "followed Hitler because he promised to make Germany great again." 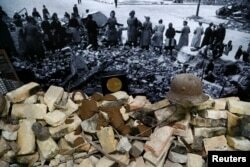 The exhibition, which features photographs, Hitler's drawings, films portraying his marriage to longtime companion Eva Braun, and a model of Hitler's bunker, has attracted around 20,000 visitors since opening two months ago.